This week we talked about how to stay safe in many different aspects. The children did different activities with road safety, bike safety, etc. They talked about the importance of traffic lights and what they mean. They also played "Red light, Green light" and learned a song about the right way to cross the street. They also practiced the bike hand signals and talked about being careful to not put things in our mouths that we are not sure are safe. The letter this week was Y. Several of the classrooms did different art activities for the letter Y and they all turned out really cute! The 2 year olds say "Y is for Yarn"! The 3 year olds think "Y is for Yak"! And the 1 year olds practiced lacing with Yarn! To reinforce the number of the week, the Pre-K class was given 5 popsicle sticks to build a house in any way they wanted. Where did all the animals go?? It's time to talk about hibernating! The children learned about several different animals that hibernate in the winter. They also discussed exactly what it means to hibernate. they made their own Black Bear mask! Cutest Black Bear I've ever seen! We also talked about some winter animals, especially Penguins, which seem to be a favorite! 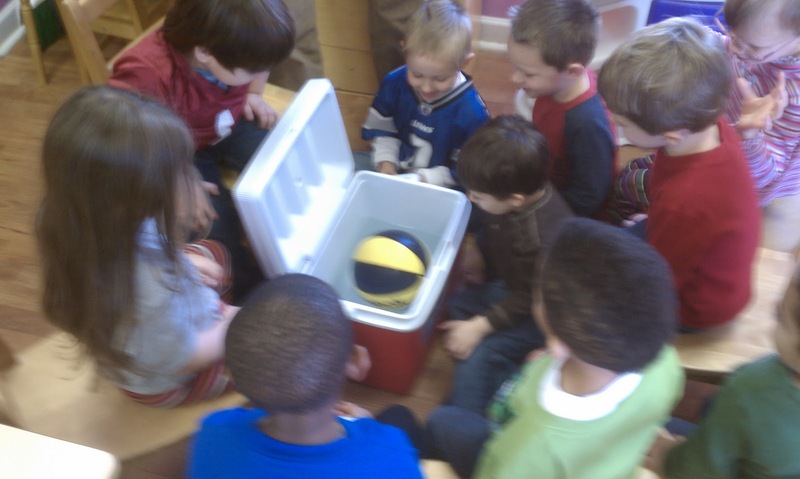 The children also learned about blubber and how it keeps some animals warm in the winter. To help them better understand this concept, they did a little experiment! We created a "glove" from ziploc bags and crisco. We then had 2 bowls of ice cold water. The children put one hand in the "glove" before putting both hands in the water. The hand with the glove (or blubber) was much warmer than just their bare hand! Our letter this week was X! 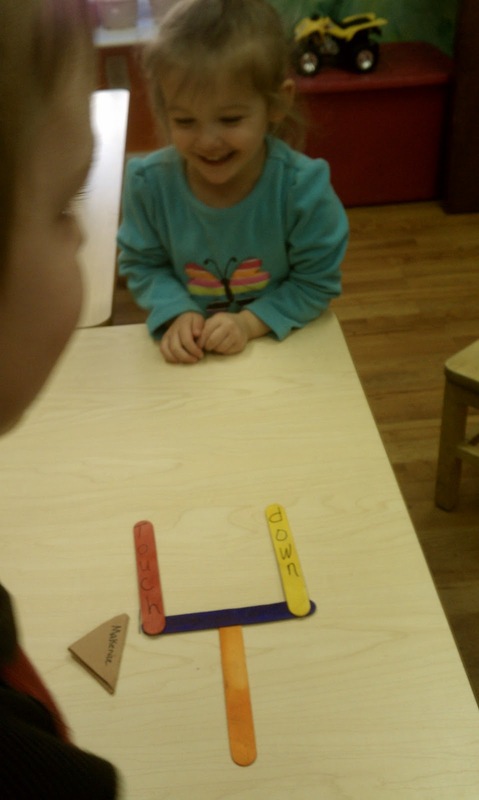 With such a limited amount of X words, we talked about the Xylophone a lot! Can you tell what the color of the week was from their shirts?! This week we talked about important leaders in our history to help us better understand Martin Luther King Day. The children did several activities that revolved around Martin Luther King, Jr. and his famous "I have a dream" speech. The 2 year olds made a precious banner! The Pre-K class created a sign to show that they were all friends! they made a cute cloud to remind them to reach for their dreams! they made a birthday cake for Martin Luther King, Jr. with 3 candles on it! The children also learned that leaders help by making changes to make our world a better place. To illustrate how changing things creates a different outcome, the children made goop! They had so much fun playing with goop because if you push on it, it will harden and as soon as you let go, it turns gooey again! And of course, we had some fun with our letter of the week- W! Making Waffles for the cooking project! Yum! We had a fun filled week but all of the talk about leaders would not be complete without a game of "Follow the Leader"! With everyone making New Year's Resolutions based on getting in shape, we decided to join in too! Plus, the excitement of Playoff games, the National Championship, and lots of basketball games had us talking about sports! The children learned about all kids of sports like basketball, football, hockey, baseball, etc. Playing our version of Basketball! *Sorry the picture is so blurry but it was too cute to not include! One of the art projects this week was to make a field goal post and a football to play a game of paper football. The kids had so much fun playing! The 3 year olds came up with a different way to play! 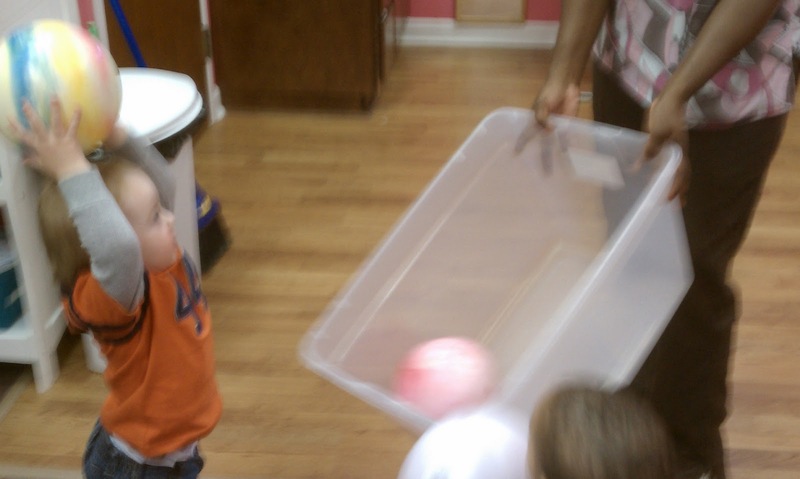 For a science experiment the Pre-K class tested different sports balls to see if they would sink or float. They made predicitons first and then watched to see what they would do! For the letter "V", we did a cute art activity and our cooking porject. They made Veggie dip to go with their Vegetables for snack. The 2's had some fun with the color of the week too! This week we talked about bringing in the New Year in order to get us ready for 2012! The children learned about traditions associated with New Years and even pretended to have their own celebration in their classroom. They made confetti, party hats, and practiced countdowns! Decorating the paper to use for her Party hat! Using paint to make their Party Hats extra special! Our cooking project this week was based on a belief that some people follow. Food items that are round supposedly give you good luck for the next year as it symbolizes the end of one year and the beginning of the next. Therefore, the children made baked doughnuts and they were outstanding! They cut out the centers with a circle cookie cutter. Once they were done baking, the children enjoyed every bite! The children talked about the differences in things that are old and those that are new. They also discussed making New Year's Resolutions! We hope you have a WONDERFUL 2012 and that it is more than you could have ever wished for!